The Kobus magnolia (Magnolia kobus) is a lovely deciduous small tree (or large shrub) that produces perfumed white flowers. This species has been crossbred with the star magnolia (​Magnolia stellata) and the resulting hybrid is the Loebner magnolia (Magnolia x loebneri). This species is Magnolia kobus and it is in the Magnoliaceae family with the rest of the magnolia trees and shrubs. There are two possible varieties according to some botanists: var. kobus and var. borealis. Some also believe the star magnolia (Magnolia stellata) is a variety of this species, making it var. stellata. In addition to Kobus magnolia, this tree is also called northern Japanese magnolia and Kobushi magnolia. Magnolia kobus is best suited for gardens in zones 5 to 8. It originally came from Japan. This tree is 25' to 40' tall on average, though it can be over 75' tall under optimal conditions. At first, it is pyramidal, but over the years it will branch out into a rounded shape. Your planting site should receive full sun to partial shade. The dark green leaves are obovate in shape and 3" to 8" long. In autumn they will change to a yellow or yellowish-brown color that is not usually notable. A multitude of lightly perfumed blossoms appears during the start of spring before the leaves appear. They are white with hints of pink and up to 4" across. Instead of distinct petals and sepals, they have tepals, which are flower parts in the perianth that all look alike. It may take many years for the tree to start flowering reliably. Blooming may also be disrupted if the flower buds are hit with frost. The fruit is an aggregate (cluster) of dry fruits called follicles. Each one contains reddish-orange seeds. You can use this as a specimen tree to provide early spring interest because it blooms before many other plants do. If you want it to take more of a tree form, train it to have a central leader. This is a good magnolia species for those who live in cooler climates. An interesting cultivar is 'Wada's Memory'. It is sometimes listed as Magnolia salicifolia 'Wada's Memory' or as a hybrid of the two species (named Magnolia x kewensis). It is columnar to pyramidal in form with large blossoms and blackish-green leaves. 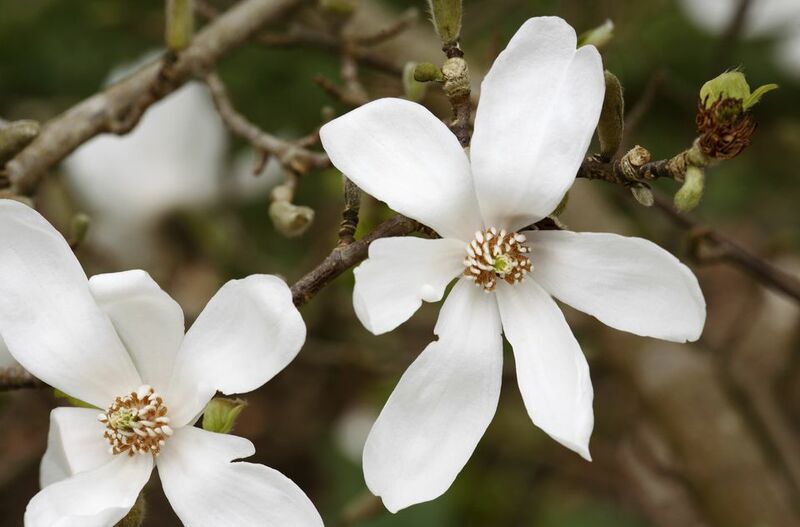 Acidic or neutral soil is best for the Kobus magnolia, though it can handle a little alkalinity if needed. The ground should also be moist but drain well so that the tree does not get rots. You can propagate this magnolia species by germinating the seeds or rooting cuttings. If you are using seeds, they will need to go through stratification (a period of cold storage) before planting. Trees grown from seed will also take longer to start blooming. This tree likes to form multiple trunks. If you prefer the look of a more traditional single-trunked tree, choose a central leader when it is young and train it to be the main trunk. Any pruning should be done in the middle of summer once the blossoms have ended and the leaves appeared. There are fortunately few problems associated with the Kobus magnolia. Scales may appear, bringing with them honeydew and the possibility of sooty mold. If they do, treat with horticultural oil.